The "Main Medication" screen is for viewing medication history of all of the animal's listed in the "Main Animal" screens. The page for viewing is divided into two parts. The first part is for animals that have been given medication, The second part is for the animals that have no history of being medicated. The medications cannot be listed by only animal type. Each individual animal that has been medicated must be selected to record the medication. The recommended method of entering medication is as it is given to provide an accurate medication history. 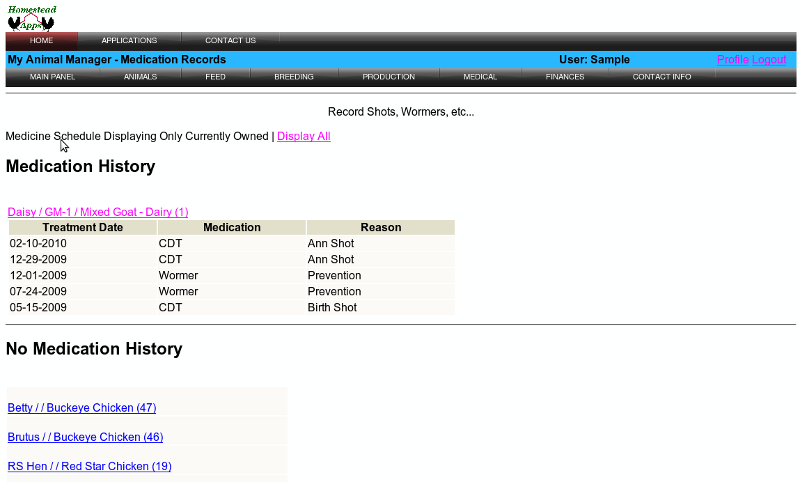 From this screen the individual animals may be selected for adding and editing the medication history.